McCandless Lunar Lander is a concept for a robotic lunar lander that will be proposed as one of the commercial cargo vehicles for NASA's Commercial Lunar Payload Services (CLPS). The lander is being designed by the aerospace company Lockheed Martin, and it is based on the successful Mars landers Phoenix and InSight. On 29 November 2018, NASA announced the first nine companies, including Lockheed Martin, that will be allowed to bid on contracts by the Commercial Lunar Payload Services (CLPS). These contracts are indefinite delivery, indefinite quantity contracts with a combined maximum contract value of $2.6 billion during the next 10 years. The first formal solicitation is expected sometime in 2019, to transport payloads for clients focused on exploration, in situ resource utilization (ISRU), and lunar science. 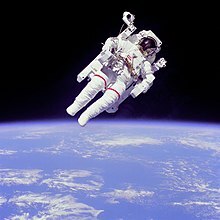 The McCandless lander is named in honor of the late astronaut and former Lockheed Martin employee Bruce McCandless II, who in 1984 performed the first free-flying spacewalk without a lifeline to the orbiting shuttle, using a jetpack built by the company. The McCandless lander design is based on the successful Phoenix and InSight Mars landers, built by Lockheed Martin for NASA. The lander will be proposed to the new Commercial Lunar Payload Services program (CLPS). It would be able to deliver to the lunar surface up to 100 kg (220 lb) of usable payload. including stationary scientific instruments, small deployable rovers, or even sample-return vehicles. The lander's system incorporates on-board radars and a set of rocket thrusters for deceleration and soft-landing. It will not need the aeroshell and heat shield, as the Moon has no atmosphere. ^ a b c NASA selects nine companies for commercial lunar lander program. Jeff Foust, Space News. 29 November 2018. ^ Next moon lander could be made in Colorado. Marcia Dunn, The Associated Press; Published by The Denver post. November 30, 2018. ^ a b Lockheed Martin Selected for NASA's Commercial Lunar Lander Payload Services Contract. Yahoo Finance. November 29, 2018.